You would think we are in Seattle with all the Dog-Piling of Oregon fans on the stack of the #Fire Mark Helfrich movement around here. As you all know, I am not in that group, although this site will allow editorials on both sides of this discussion and we have certainly had some juicy articles on that topic lately. Yet, I notice how these disgruntled fans will be quick to point out issues or perceived shortcomings of coach Helfrich, but you will wait a long time to see any acknowledgement of when something was decided that was brilliant in retrospect, obvious to us fans now but chock full of facts known to only the coaches at decision-time. Yet look what this young man has done already! 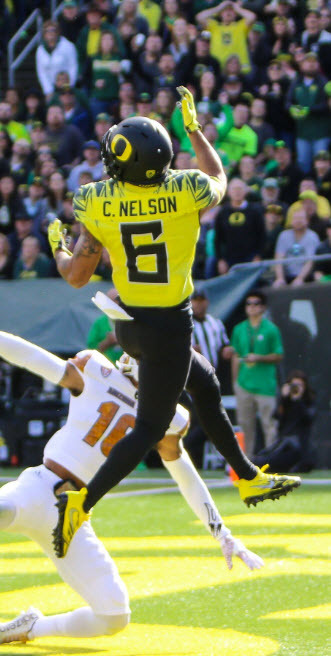 Charles Nelson is about to haul in an incredible TD pass from Justin Herbert! He has set the new total yardage record in one game against ASU, and tied the most passing yardage in a game in only his third start? He threw for 73% completion rate on Saturday while throwing a couple passes away to preserve field position and has a 12 touchdowns to 2 interceptions ratio already? My friends, that is just insane. Remember that this was accomplished behind four redshirt freshmen offensive linemen and Justin has shown some wheels in the running game, if not a bit too much courage for my taste. Then the morning Register-Guard reports that Herbert’s 10 touchdowns in two games has only been done by one other quarterback in the history of Oregon football; any guesses who? (If you chose St. Marcus, you are correct.) Keep in mind that Mariota did it as a redshirt freshman in his ninth and tenth games as a starter while Justin is a true freshman in his second and third start. Unfricken-believable. Remember when the GOC wrote the article “I know who will be next NFL 1st Round QB from Oregon” and everybody howled at the title? Retired coach Mike Morris knows his stuff, and he saw it in Justin at the open practice just two weeks into fall camp. I guess Lubick and Helfrich knew what they had going into the game with the Huskies … and we fans did not. 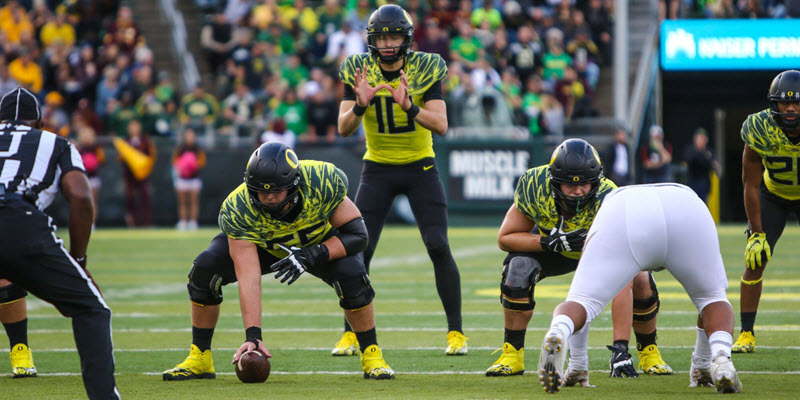 Do you still think you know more about offensive football than Mark Helfrich?